This page shows an example of how I work with a client with an individual commission. If you have any questions or are interested in commissioned art please contact me via the form at the bottom of the page. As part of my assemblage art, I offer personalized design/art commissions. I have a client who has requested an assemblage gift for her son who is graduation from college. He is also an artist (no pressure there) and she has given me these specific parameters. #1 wants me to use a box that can be easily moved with him. #2 she will give me a small 3×3 inch watercolor painting that he did as a child. #3 she wants it to invoke her family love and hope for his bright future. In my next posts I will be share how I work and my methods and reasoning for the finished piece. Hope you enjoy. To start this assemblage I begin by selecting what the client specified. She wants this to be an assemblage using a box. 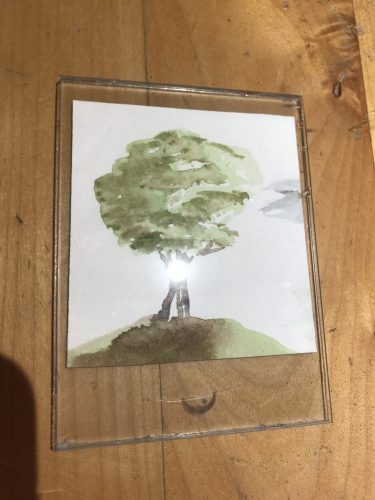 She wants it to be small enough to be easily transported and it has to contain the 3×3 inch watercolor painting that her son did that she will give to me at our next meeting. 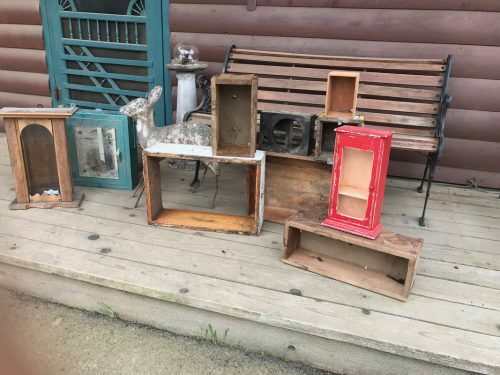 These are the boxes that I have that I will select from. I can alter these, maybe cut one down, add a back, or change the finish. I will show you what I selected in the next post and tell you why. 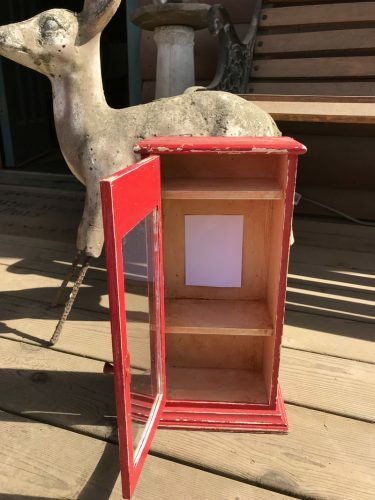 I chose the little red cabinet for a number of reasons. 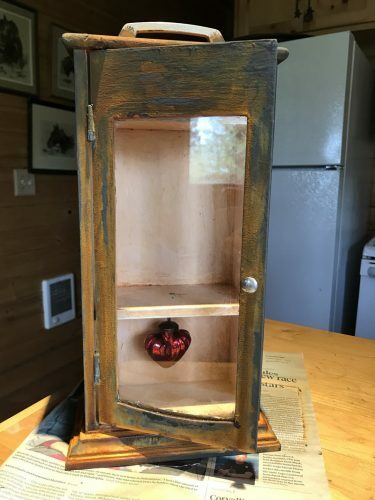 First of all it is small 15 inch tall an 9 inches wide so it is easily moved. It will also work well with the 3X3 inch watercolor painting that my client will give me. The box is divided into three compartments which will work with my design concept. I am now starting to develop the three spaces with a design concept. My client wants me to convey a childhood with a solid foundation yet fostering a free spirit and wishing him a wonderful future. I will interpret her wishes in my design concept by working with the lower space as a loving childhood. The middle space will represent his art, education and growing into the man he is. The top space will share the parents wish for his future. I also chose the cupboard because it has a small door to protect the contents. I have some work to do but will be back soon with some progress. I now have a piece of paper where the 3X3″ watercolor painting will go. 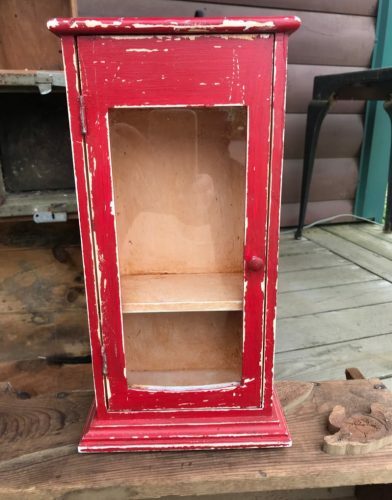 The little red cabinet is now a rust finish cabinet. Why change the color? Because my client liked the finish she saw in my studio of the Appaloosa horse. Please check out my website to check out the horse (it is in the sold category). This is one of my reasons why I ask clients to come to the studio – so they can see possibilities. I have now backed the watercolor with burlap for interest and texture. When my client was in the studio she liked some dominos that I had, so I used them as a base and behind the watercolor as well as a base for the other spaces. Dominos have the same basic structure as bricks. Bricks are used frequently in buildings to show strength and permanence. Banks, government building, hospitals often use them for this reason. I am using them in the assemblage to show a strong solid foundation for his childhood and his future life. 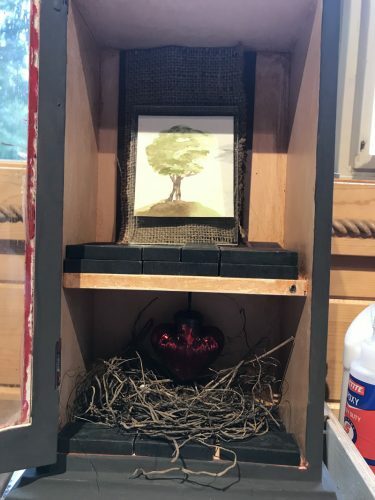 The lower shelf has the nest and glass heart. I elevated the heart to symbolize the son leaving the nest. Just have the message in the top shelf. Almost there. The final piece of the puzzle was my clients wish for her son. 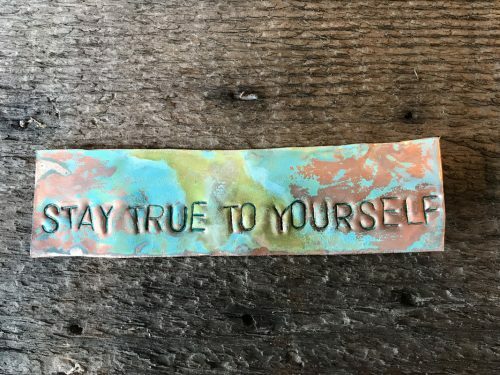 She specifically wanted to say “Stay true to yourself” and it had to fit into that small space, needed to be large enough font to read, and have that natural Wabi Sabi feel. Now I just need to put it all together and hope she likes my interpretation. Final picture soon. The commission is done and I am pleased with it. I’ve tried to stay true to my esthetic keeping in mind the wishes and intent of my client. 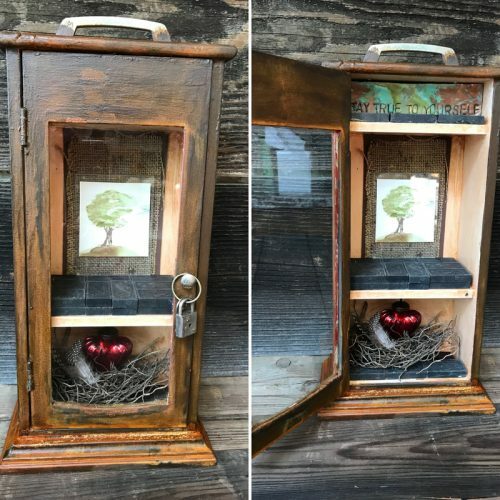 I added the small lock and key to the door pull to signify the keys to his life which are represented in the box. The nest with love and some feathers from a mother/son hike in the woods. The special child watercolor and the dominos representing his art and childhood on firm foundations. Lastly, and I did this on purpose, is his mothers special personal and hidden wish, “Stay true to yourself” only to be seen if you open the box. I hope you have enjoyed the journey with me and that you gain more understanding into the artistic process. In keeping with my mission to help charities, proceeds from this sale will go to Fences for Fido a non-profit organization that builds fences free of charge for families who keep their dogs on chains, tethered or in small enclosures.